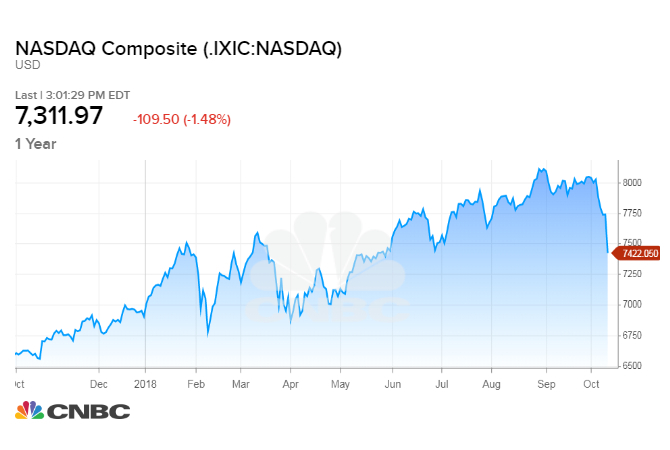 The Nasdaq became the first major U.S. stock market benchmark to dip into a correction during trading Thursday. A correction on Wall Street is defined as down more than 10 percent from its high. The S&P 500 and the Dow Jones Industrial Average have further to fall to be in a correction with both down about 6 percent from recent all-time highs. Amazon, Netflix and Alphabet are all in correction territory after taking big hits this week. Rising interest rates are hitting the whole stock market this week, but especially tech stocks as investors worry their rich valuations won't be justified in a higher interest rate environment. These names are also the biggest winners this year and during the whole bull market so some investors may be taking profits amid the broader market sell-off. Micron and Tesla are off 35 percent from their 52-week highs. Facebook has fallen more than 30 percent. Netflix is down by 25 percent from its high and down nearly 10 percent this week alone. Amazon is off 17 percent from its high and by nearly 10 percent this week alone. Nvidia, Intel, Alphabet are also all down more than 10 percent from one-year highs. Many of those stocks were higher as trading began Thursday, but dropped again as the massive selling returned to the Street.